Be part of a network of multiple small federated, interoperable video hosting providers. Follow video creators and create videos. No vendor lock-in. All on a platform that is community-owned and ad-free. 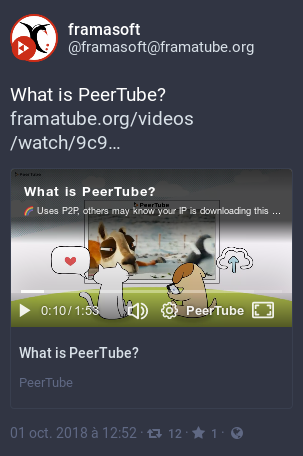 PeerTube is a free, decentralized and federated video platform developed as an alternative to other platforms that centralize our data and attention, such as YouTube, Dailymotion or Vimeo. :clapper: But one organization hosting PeerTube alone may not have enough money to pay for bandwidth and video storage of its servers, all servers of PeerTube are interoperable as a federated network, and non-PeerTube servers can be part of the larger Vidiverse (federated video network) by talking our implementation of ActivityPub. Video load is reduced thanks to P2P (BitTorrent) in the web browser via WebTorrent. Follow your favorite channels from PeerTube or really any other place. 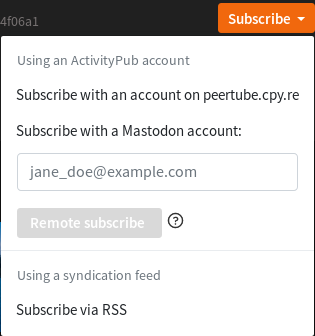 No need to have an account on the instance you watched a video to follow its author, you can do all of that from the Fediverse (Mastodon, Pleroma, and plenty others), or just with good ol’ RSS. Content creators can get help from their viewers in the simplest way possible: a support button showing a message linking to their donation accounts or really anything else. No more pay-per-view and advertisements that hurt visitors and incentivize alter creativity (more about that in our FAQ). You don’t need to be a coder to help! See the architecture blueprint for a more detailed explanation of the architectural choices. 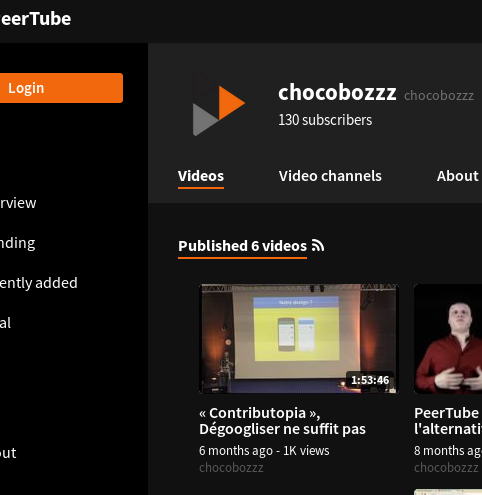 We have run a crowdfunding campaign to pave the road to the version 1.0.0 of PeerTube. Thanks to everyone who pitched in and shared the news around!